For thousands of years, Jewish women have cherished the mitzvah of Mikvah as an opportunity to infuse their lives and their homes with spirituality and holiness. According to tradition, water symbolizes purity, life and the abundance of G-d's blessings. Participation in the mitzvah of Mikvah is a bond between each Jewish woman and the generations who have preceded her, between husband and wife, and between each of us and G-d. The mitzvah of Mikvah affords us an opportunity for introspection and renewal. Currently we are raising money for this very important project. If you would like to contribute, please click here. 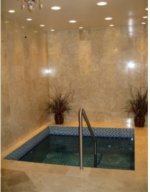 If you would like to join the Mikvah Committee or have any suggestions please email us at info@glenbrookmikvah.org or use the contact form.